Creativity is a path to happiness. The more time we spend being creative, the happier we’re likely to become. In addition, creativity is an essential aspect of innovation, which will propel us to a brighter future. As kids many of us are naturally creative. Unfortunately, our creativity tends to be eliminated as we enter school. So, here are ten ways to boost creativity. The really good news is that we can reclaim our creativity. In addition, we can help our kids preserve and develop their creative capacity. Here are ten (hopefully fun) activities designed to engage your skills of creativity. Using each group of words, compose a short story, skit, poem, song, movie, dance, etc. Let your mind roam free. If this becomes hilarious and a bit chaotic, so be it! Maybe you could try this exercise the next time you need an icebreaker in the office, the classroom, or anywhere else. Plus, you might learn a thing or two by looking up the meanings of any people, places, or things you don’t know about. The more we learn, the more creative we can be! My wife and I love to eat out at a certain hamburger place that lets you “dress” your own hamburger. How can you complain when everything but the meat and bun are put there by you? I was busy making the rounds between the lettuce, pickles and mayo when I saw a youngster, about six years old or so, having fits with the ketchup dispenser. He had more ketchup on him, the counter and the floor than he had in the little paper container. I told him that, since I had one free hand, I would pump the ketchup out for him if he would hold his container under the spigot. Mission accomplished, as I returned to fixing my burger. But as the boy turned to walk away, he looked back at me and smiled. “Thank you!” he said softly. I’ve got to tell you, his thanks trumped the heck out of a little ketchup in the cup. I almost felt guilty that I hadn’t done even more for the lad. In fact, this little 30-second scenario caused me to remember something my grandmother taught me when I was about the same age as the ketchup boy. One of my greatest thrills as a youngster came in the winter when my grandmother would stay with us in south Texas. Her husband, my mother’s father, died when I was an infant. Consequently, loneliness and the tough Oklahoma winters convinced Grandma to go south by train to stay with us through the coldest months. I always cherished our time together, albeit those opportunities slackened a bit as my sister and cousins came along. On one occasion, however, it was just Grandma and me. We had the whole house to ourselves and a grand plan on what to do with the opportunity: We were going to make a batch of cookies. Now, Grandma’s sugar cookies were legendary. With a bit of pleading, I convinced her to quadruple the recipe. As cookies came out of the oven, I soon realized there were not enough jars in the house to hold them all. True to her sensible ways, Grandma solved the cookie problem. She had me put the excess cookies into sandwich bags while she cleaned the kitchen and grabbed her sweater. We then called on neighbors up and down the block, sharing our bounty with them. It was an exercise in kind giving and appreciative receiving that has remained with me all these years. In reading this, I’m sure there are those that would say this sort of kindness has gone out of style, that it would no longer work. Who would dare take those cookies from a semi-stranger at their door today? And, even if they took them, would they actually eat them? Who’s to say? Still, if she were with us today, I believe my grandmother, by example, would be teaching her grandkids, great-grandkids and great-great grandkids that any kindness, however small, still counts. Understanding the subconscious mind will help us to focus on the importance of instilling positivity in children and teens. Your conscious mind is your reasoning mind; therefore, once you accept something to be true at the conscious level, it then goes into the subconscious mind and that is what produces your results. Your subconscious mind produces your actions. So, if you want to change the results you are getting then you must begin to alter your thought process. You can alter behavioral patterns in children as well as adults. In doing so you must understand the developmental periods of a child’s life. From birth to seven is the imprint period; in which everything is absorbed from the environment. Parents and relatives have the most impact on the child during this particular time. From seven to fourteen is the modeling period and this is a very crucial stage. They break away from the parent and model the behavior of other children, movie stars, singers, etc. Many parents will ask me how it is possible to raise two children the same way and have them turn out so differently. That’s because they go in different directions and are influenced by others. From fourteen to twenty-one is the socialization period. This is where they become individualized. So it doesn’t matter what influences they have encountered because you can always alter behavior. Understanding these periods helps us identify where the obstacles surfaced. Your subconscious mind doesn’t reason; therefore, you must be very careful as to what you plant. We are made up of energy, so it’s important to get our children in a positive energy flow so they are able to attract positivity. There are many ways to get that energy flowing in the morning. I talk frequently about the importance of gratitude. Most people tend to focus on the negatives of life. Positive and negative can’t occupy the mind at the same time, and, since negative is the dominant emotion, one must work very hard to replace it with positive. Another key tool is to teach them the importance of positive affirmations. Get them in the habit of saying positive statements such as…”I can…” or “I will…” Repetition is key, so, as they get in the habit of saying them, the greater positive influence they will have. Get your children excited about their goals and have them create a vision board. It’s another powerful exercise of the mind that will keep them in a focused and positive environment. When I talk to parents about how their child is thinking, they often ask me, “Well, how do you know what he’s thinking?” The answer is simple; I ask the child, “What are you thinking? And I do my best to help them from there. Asking is worth the effort, but it’s not always a simple matter. One of the obstacles a counselor or a therapist faces with a child or adolescent is the youngster’s perception that they are in trouble, and that the counselor or therapist is a consequence of their behavior. Often, that’s exactly the case, so it’s not unusual for kids to be guarded initially. Ask with acceptance: They know if you can do this or not, and they pick up on it quickly. About a year or so ago, I worked with an elderly fellow in a nursing home. While trying out his new scooter that had just arrived from the VA, he accidently ran over a lady’s foot. His “punishment” was psychotherapy … ME! You know, Sarah, I’m not sure I understand, but I WANT to understand. Can you help me understand what you mean? Ask with empathy: No youngster goes to see a counselor or therapist because their lives are going splendidly. There is pain somewhere and it’s seen in the sort of discomfort that is almost palpable. Tommy, it seems to me you don’t really want to be here right now, that you’re uncomfortable about this visit. (I usually pause for some sort of acknowledgement.) If I could do something that would help you feel better about it, what would it be? The youngster might or might not offer anything specific, but the question is disarming and amazingly soothing. It also helps to get to issues quickly. Tommy wants to know you care, and that you will actively demonstrate that caring. Here’s a video on using a big, silly pair of balloon lips in therapy or counseling with young people. There are a lot of ways to use them, but they are especially great for developing rapport with a youngster and getting a smile and more involvement from a shy or reticent child. Webnote: If you find defiant and oppositional youngsters especially frustrating from time to time, consider subscribing to the ODD Management Digest. This is an email publication that Dr. Sutton publishes monthly. It is filled with great insights and ideas on working with difficult youngsters at home, at school, and in the counseling office. There are also “freebies” in every issue; good stuff! 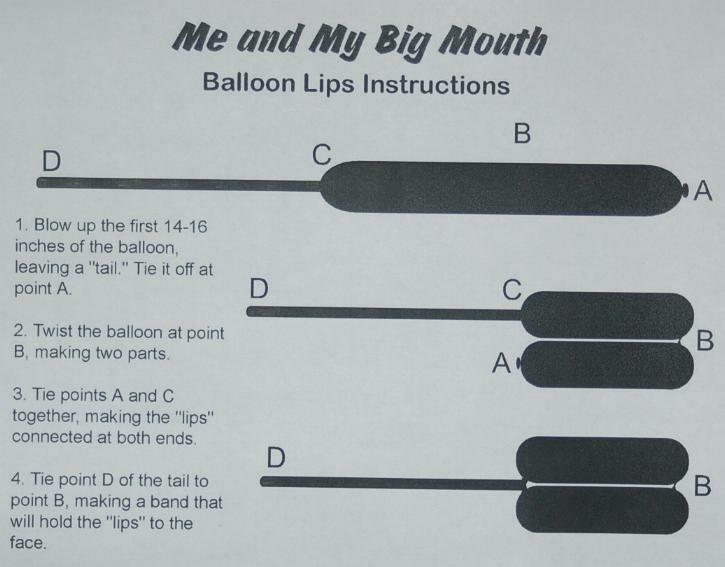 Beneath the video we will include the instructions for making the “Big Mouth” balloon lips. These balloon lips are made from the long, skinny balloons that clowns and magicians use to make different animals. They are sometimes called “260″s, or “twisting” balloons. Most party stores or magic shops carry them, or you can simply look up “twisting balloons” on eBay. Enjoy. The plan worked. Ron shared how he made it through 14 cartons before … well, you know. What happened next, however, was something he had not planned on. That evening, these students gave their folks an account of what had happened in class. Ron then began hearing from parents. They told him that, if he was willing to make himself sick to hold their child’s attention in class, he had their complete support. Just how reachable would kids be if we were willing to pay the price to make it happen? Well, he charged my battery; that’s for sure. Ron Clark’s efforts to challenge youngsters to a lifetime of achievement continue through his school in Atlanta, The Ron Clark Academy. I wonder if he lets them serve chocolate milk there? I just returned from a great trip to Canada, Alberta to be exact. I flew into Calgary to do some training for the Alberta Teachers Association, an absolutely top-shelf organization. The conference was held at the Delta Lodge at Kananaskis, in the Canadian Rockies near the site of the Calgary Winter Olympics. In speaking with teachers there, I learned something about tolerance for cold weather. I made the comment that, at some point, minus 40 degrees (common in the area) wouldn’t seem much colder than minus 20. I was IMMEDIATELY corrected on that one. Interesting, huh? It’s all a matter of HOW and WHERE you grew up. The human body is a pretty resilient organism. We DID agree on the fact that today, more than ever, parents and teachers need to step up to the plate and love, affirm, guide and educate their children to experience and master not only the temperature, but all the “climates” they will encounter in this ever-changing and evolving world. And that will remain constant whether you live in Pleasanton, Texas (USA), Calgary, Alberta (Canada), or any place else. What Does “Live Like …” Really Mean? Much inspiration for what I write in It’s About Them comes from a couple of little newsletters sent to me by Jim Gentil of Austin, Texas: Positive People Power! and Positive Spiritual Living (read by folks in over 30 countries). Somehow, some way, Jim seems to have a knack for sharing something that touches me deeply. This piece is one of them. Since Jim always encourages us to share his thoughts with others, I’d like to pass them along to you. What does it mean to live like you were dying? It means to squeeze every drop of juice out of life that you can. It means to live life to its fullest potential. It means to do things that give you an adrenaline rush. It means to open your heart and mind to a world where all things are possible. It means to smile and laugh and play a little more everyday. It means to become more than you currently are. It means taking the time to dream. It means pursuing your dreams with everything that’s within you. It means to stretch yourself and go beyond the known into the unknown. It means to follow your heart and fulfill the desires that inspire you. It means to forgive others and find true freedom and peace of mind. It means to love others like there’s no tomorrow. It means do what you have always wanted to do. It means being the person you were created to be. It means to have faith in the process of your life and trust that everything is going to be all right. It means taking control of what you can and accepting what you can’t. It means daring to believe. It means focusing on what’s really important to you personally. It means you ignore all the petty stuff of life. It means you don’t let things get under your skin. It means seeing others through eyes of compassion. It means giving mercy to every one you meet. It means creating meaningful moments that you’ll never forget. It means being your personal best. It means acting in spite of your fears and discovering that fear is an illusion. It means doing something you’ve never done but have always wanted to do. It means saying “I Love You” more often. It means to give more hugs and holding the embrace for a second or two longer. It means saying what you mean and sometimes not saying anything at all. It means breathing deep and letting your cares go. It means to give away what’s precious to you. It means to hold all things loosely. It means to understand that we don’t really own anything anyway, we just get to use things for a while. It means to lighten up and not be so serious. It means to go for it whatever it may be. It means to take a leap of faith. It means to be free. If we were to truly live these words, our lives (and the lives of those we touch) would never be the same, would they? What a positive challenge. Thanks, Jim. I was pouring through my collection of quotes this morning and this one came to my attention. I believe what Chief Tecumseh said is not only true and a standard to live by, it’s something we must pass on to our children. If we cannot express gratitude, we will sour from the inside out. If happiness is a worthwhile state (it could never be a goal, lest we lose it in the capture), much of that state relies on being truly thankful. Have you ever met someone who was too bitter to be thankful for anything? My guess is you didn’t really want to spend much time in their presence. Besides, bitterness is quite contagious. On a personal level just the name “Tecumseh” brings a smile to my face. My parents were raised in Shawnee, Oklahoma. Although my sister and I grew up in Texas, and live there still, Shawnee was a very special place … Grandma’s. Anyone who knows the area knows that, when you come from the south on 177 (through Stratford and Asher), Tecumseh is just a few miles from Shawnee. Tecumseh was near the end of our journey at Christmas and on summer vacations, a sure sign that Grandma was but moments away. I’d have to say that, in those days, I knew more about WHERE Tecumseh was than WHO he was. But either way, the gratitude is still there. I don’t believe I ever put up TWO posts in the same day, but this one couldn’t wait. Today, Brad Montgomery, CSP and humorist mentioned that he was to speak Monday at the opening of the schools in the area in Utah were the miners were trapped. He was asking for input on how he should approach his program, and he got some great feedback. You know what, that’ll never make the front pages, but it ought to. Pass it on, and God Bless. “The material we put into our stomachs is enough to have killed most of us sitting here, years ago. Red meat is awful. Soft drinks corrode your stomach lining. This little piece goes to prove that, regardless of one’s race, creed or color, there’s no call for being rude. I’d like to dedicate this one to the memory of my wife’s father, Bob Richardson, and the thousands more like him who make that historic landing on Omaha Beach.